In the year of our Lord 1200, while in pursuit of the dread pirate red beard (the Pig), your ship was lost in a violent storm off the coast of a mysterious island in the south sea. Stranded, all alone and away from society, you and your crew must build a settlement to brave the elements and defend yourself from the wild beasts that roam this place. As fate would have it, this island happens to be one of Red Beard’s favorite places to stash his stolen bounty. He does not intend to share it with you at all! Your ultimate goal is to gather enough resources to build a ship large enough to carry you and your crew back to civilization. You are isolated from society and there is no one to trade with you. You must manage your resources wisely, especially food. Your engineers and masons are capable of building stone towers and a gatehouse, but can not build stone walls or stairs due to their primitive equipment. Playability: 5. This is one beast of a scenario. It took me four tries to finally get through it. I played it twice on very hard and was completely overrun. I set it aside and came back to it later. This time I changed the location of my keep. Again I got trounced, but I saw some possibilities. At that point I thought maybe this map just can't be played on very hard, so I tried a fourth time on hard setting. With some fresh ideas and extreme micro managing I got through it. Encouraged, I had to try it a fifth time on very hard and the same tactics worked on that setting. This map has some unique combinations of elements which I found very challenging. You're working with spear men, mace men, pike men and bowmen only, wooden defenses, but you do get stone towers and stone gates. No stone walls or stairs. No trading, no moats, no killing pits or pitch ditches. You do get boiling oil, however, plus ale, and your choice of food production. Nice assortment of wolves, bears, plagues, fires, bandits, etc. But what really makes this map interesting is the terrain and the many, many large invasions. The terrain, because this map is basically a skull shaped island, sort of roundish with signposts on either side. Most of it is rough, flatish land with some grassland, and low cliffs near the sea. There are some low hills around the eyes, but they are very rocky and not a place you can stage a defense. There is no clear cut place for the keep. You have many choices. But no matter where you put it you're going to get hit from both sides and the only defense you have will be the walls and towers you build. The terrain will help you very little. The invasions are large, not shy about attacking en masse, tend to attack on two fronts at once, and with a nice balance of units. Since many of them are armor and include siege engines, and you with no crossbows, building walls that will hold back the constant onslaughts is quite a challenge. I have never before built such massive walls or spent as much time thinking up a defensible gate as in this scenario. I've also never had such a challenge in starting a scenario. It was not too hard to start up with my first keep location. However, when I moved the keep on my third try, I think it ended up in a much more defensible place, but was also smack in bear country. You start with very little, no defensive units and no weapons, also no trading post. I sent out woodsmen and they were all promptly mauled by bears, too many for the lord to kill. They keep trudging out to their huts and repeatedly get killed. After several restarts and a lot of thinking and improvising a new strategy I was never so happy to finally make my first bow. Then I could kill bears, chop wood and begin building. And build you'd better, because when the enemy comes, they're coming for your head. A great experience. I loved this map. Balance: 5. Superb balance. With terrain that makes you think and plan your production and defenses carefully by not making it easy. It provides no real natural defenses, yet provides lots irregular topography that makes you work to set up your production. You can set up your keep closer to quarries, iron deposits and pitch bogs but there may be tradeoffs. Great choices of which units, buildings and defenses you have access to. Well balanced events, well timed and well balanced invasions. Creativity: 5. 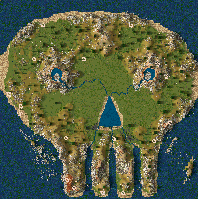 While making a skull shaped island in one sense seems hokey, it actually makes a unique, memorable and wonderfully playable map. Obviously a lot of work went into this. Map Design: 5. Lots of varied terrain, including rocky, hilly, rippling, grassy plains, cliffs, beaches, streams, all wonderfully detailed and realistic looking. Story/Instructions: 5. Short but very effective story that sets up the scenario beautifully. Proves that it's possible to set up and draw you into the story in very few words. Loved this map. A great challenge. I don't know how it plays on normal, but it really runs you through your paces on very hard. I haven't got very far with this. Absolutely the first thing I did was to build a fletcher so I could kill bears. I have six archers by the time the enemy attacks with a goodly number of guys. I thought, aha, I'll ring my keep with bakeries and set 'em on fire. While it's possible to collect pitch, it isn't possible to lay it down. My next step would be to build a wall, but you can't do that, so I gave up on this scenario. That's a downer, as it's one of Sparrow's challenges, but I think it's a crap mission. Sarariman, this map was created over 9 years ago. Sorry I can not give you any tips because its been such a LONG time since I have played it. I assure you, it is winnable but very difficult. I remember getting stone and towers up qickly is a priority because you are prohibited from building walls.